We have a huge selection of mobile phones and house phones from the 40's through to the current day. It's quite amazing to see how phones and more specifically mobile phones have developed over a very short space of time. All of the phones have an information panel next to it giving details of the date it was launched and some facts about it. 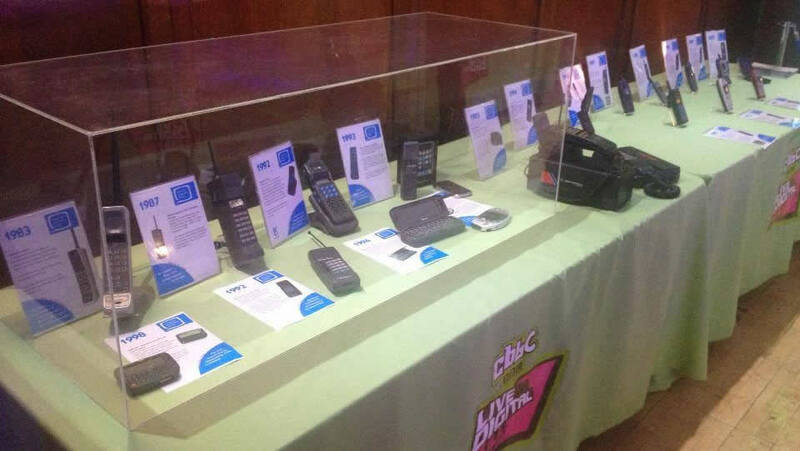 The timeline display can start from the forties bakelite phones through to the eighties homephones and first mobile phones, all the way through to current day smart phones. Some of the highlights include the Rabbit phone, early nokia phones, the first camera phone, the first Blackberry, the first iPhone and many more. We will bring all of the information panels and phone stands. A risk assesment can be supplied as well as our public liability insurance certificate. We are able to supply the required 6ft x 2.5ft tables and black table cloths if required. The set-up will include one member of our staff to setup and manage the display. Our staff are also very knowledgeable and are very happy to chat to your guests about the display. The display is a fantastic way to break the ice with attendees discussing the first mobile phone they had, or how long they spent playing snake!! It demonstrates just how much technology has developed over the past 25 years and attendees can draw comparisons between the phones in the display and the mobile phone in their pocket! The timeline display is a fantastic feature for exhibitions too. These pictures were taken at the CBBC Live & Digital event in 2015.